This accessory pack includes one nylon witches hat with wire brim and attached pink wig at the back. Hat only, please note hair is pink, not black as pictured. 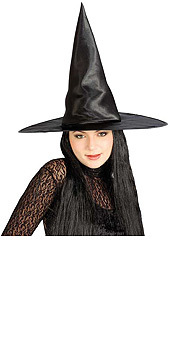 Simple yet effective, this Black hat can transform you into a wicked witch in a flash. With the attached pink wig hair at the back it can be worn stand alone or with a witch costume. You will be ready to lure the children to a gingerbread house in no time when they wear this Witch Hat with hair!